For years, there has been discussion of California becoming a Federal Milk Marketing Order. 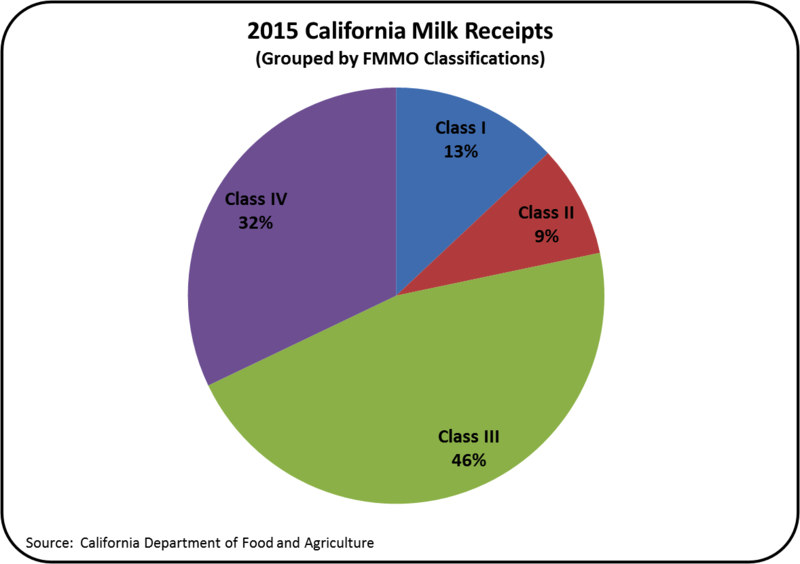 In the last few years, this has become a serious proposition with procedures and definitions developed to change California's milk payment system to a Federal Milk Marketing Order based on the component payment process. That would make about 75% of U.S. milk payment based on the FMMO component payment system, In 2017, the USDA will probably finalize acceptable language and a vote will be taken of the milk producers in California, which will likely pass. Implementation will commence immediately but it will take time to finalize the transition. How will this impact California? 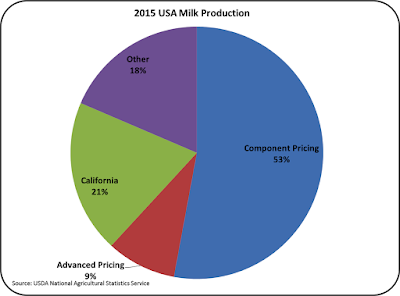 How will California's new status impact the rest of the U.S. dairy sector? How might this impact the U.S.'s status in the global markets? In this post, some of the highlights of the conversion will be covered, and the potential impact of the change will be discussed. The differences between the California payment system and the Federal Order payment system were reviewed in my March 2016 article in Progressive Dairyman. Some of the differences will be eliminated if California becomes a Federal Order, but others will remain. One of the really big changes is that there will be a specific payment for milk protein. Today there is only payment for "solids not fat" and butterfat. Although the motivation for California to become a Federal Milk Marketing Order is primarily to improve producer milk prices, the change will bring other significant changes. California is unique in its huge production of nonfat dry milk and skimmed milk powder, much of which is exported. In 2015, 32% of California's milk went to these powdered products. Another 44% went to cheese production. Skimmed milk powder and cheese both require high levels of milk protein. Under the current California payment system, payment was for "Solids not fat," which means that lactose, a low value component, and milk protein, a high value component, were valued equally. The California payment system did not provide a strong incentive for higher levels of milk protein. However, certain California cheese producers do pay an incentive for protein on top of the California minimum payment. But the change to a system that always provides a constant incentive for milk protein should stimulate producers to review genetics, nutrition and other practices to maximize protein in the milk. 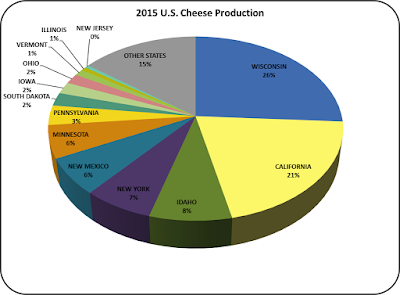 The chart below shows the major cheese producing states. Wisconsin is the largest cheese producer with over 80% of their milk going to cheese. California is the second largest cheese producer. Many producers in Wisconsin not only receive specific payment for milk protein through the Federal Order pricing, but also receive bonus payments for high levels of milk protein. If California changes to a Federal Order payment system, it will help level the playing field for cheese production. One of the unique parts of the California payment system is the existence of "quota." which enjoys a premium while "over quota" does not enjoy a premium. It is a very big factor as the payment for milk covered by "owning quota" amounts to about $12 million per month. There is an active market in the sale and purchase of "quota" and many producers have paid a lot of money to buy "quota." If the transition eliminated quota payments it would insure defeat of the change to a Federal Order. As a result, the most likely final language will include a process by which, milk over quota will be charged a penalty, and the money generated form that will be used to pay the bonus for milk covered by quota. One of the common factors for the six existing Federal Orders that pay on components is the Producer Price Differential (PPD). The Producer Price Differential is calculated as the difference between the Uniform milk price (a weighted average of the four Classes in the Order) and the Class III price less a few expenses. Orders with a higher percentage of Class I milk, which has a higher value, will typically get a larger PPD. Because California has a lot of lower priced Class IV milk, and very little Class I milk, the PPD will be small and sometimes negative. Perhaps for that reason, the PPD as proposed for California would be uniquely used as an adjustment to the component prices of protein, fat, and other solids. For more details on the impact of conversion of California to a Federal Milk Order, see my recent article in Progressive Dairyman. On February 14, 2017. the USDA announced the details of the findings and the conclusions reached. They are available publicly at this link. The conclusions reached which will be presented to producers for approval are at the bottom of this length document. Questions on the document will be answered at a meeting in Clovis, California on February 22. Some significant changes from the information above were made in areas such as the PPD. The cover letter accompanying this announcement can viewed at this link. Additional details will be provided in future posts to this blog.